Great White Shark In Captivity: Why That Hasn’t Succeeded Yet - We Love Sharks! Great White Shark In Captivity: Why That Hasn’t Succeeded Yet - We Love Sharks! Have you ever wondered why you haven’t seen a Great White Shark in captivity? You’ll need to read this. The Great White Shark (Carcharodon Carcharias) is regarded as one of the most fearsome marine creatures on the face of the earth. This is a specie that can weigh between 1,800 and 2,700 kg (4,000 to 6,000 lbs.) at maturity. Some of the largest specimens are as long as 20 feet. This fish swims up to 25 mph (40 km/h) and maybe even reach 35 mph (56 km/h) when in pursuit of prey. Also, they are a highly migratory species often crossing whole oceans as part of their normal routine. Now, what do you think would happen when you take such a creature and the second fastest shark species and put it in a tank? What Happens To A Great White Shark In Captivity? Regardless of the impressive strength and size of this shark, it’s absolutely notorious for doing very poorly in captivity. 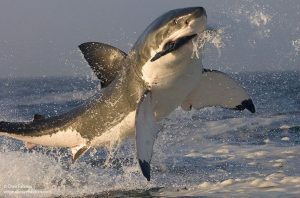 In their natural setting, the great white sharks enjoys the freedom to travel thousands of miles yearly. Scientists even discovered that a particular tagged individual swam all the way across the Atlantic Ocean. Furthermore, the variations in their movement and speed makes the border-less oceans their best home. Great whites will often swim to the other side of the world from their normal territory. Unfortunately, humans just won’t leave them alone. In an effort to provide entertainment for the public, there have been several attempts to capture and keep them in aquariums. Despite several expensive efforts to provide a “near perfect and natural” habitat, a great white shark in captivity has never survived beyond six months. Most die within days of captivity in either aquariums or pools. Meanwhile, animal and aquatic experts cannot explain the actual cause of death. The Great White is likely the worst shark humans have ever attempted to keep in captivity. Some die the same day that they are kept in a tank! To date, the generally accepted cause of death is stress and the injuries sustained during transportation. In some cases, these injuries are clearly the cause of death and they occur because the shark resists capture vigorously. Even when the shark arrives safely at its new “home,” they continuously bang their snout against the tank walls. One specimen held in Monterey Bay developed serious injuries from continually smashing into the glass. Another angle to consider is that this shark needs large volume of waters and must keep moving to keep water flowing over its gills so it can breathe. How many aquariums can afford that much space? The first great white shark in captivity was in Marineland of the Pacific in 1955. It lasted less than a day. The next recorded attempt was by SeaWorld in 1981. Though this time it lasted 16 days. Another one in the Monterey Bay Aquarium in California, a female in 2004, lasted 198 days. 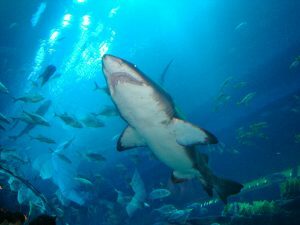 She refused to eat, was listless and eventually attacked two other sharks being held in the same tank with her. Luckily, they quickly released her back to the wild alive. January 2016, an 11.5 feet male spent three days floating around continuously and ramming its head into the tank walls till it died. Location, Japan’s Okinawa Churaumi Aquarium. You can bet there are many more such stories that are unreported. Many others have been held in tanks, but they mostly die or are released. Many researchers have tried to contain these sharks in tanks for the sake of research. Besides one such effort, all other cases ended in mortality. Even so, the only “successful” event involved very detailed planning that most aquariums may not care for. Researchers used this time to observe the behavior of the captive shark (a juvenile) during the 2004 study. After the 6-month study, the shark was released back to the ocean. However, it wasn’t all good news: That great white shark injured itself, and killed the other co-residents of the tank. These creatures are still associated with the image of blood-thirsty, man-eating monsters even though it’s been proven time and again that they are less dangerous than our perception. But people still want the thrill of coming close to them without getting hurt. Apart from the danger to the great white themselves, other occupants of the aquarium soon become lunch. Keeping and feeding such a creature in a controlled environment is nothing short of a logistics and safety nightmare. Humans have never been able to tame or keep a great white shark in captivity and they probably never will. Continuing to attempt it will only result in more avoidable deaths of a species that’s better left alone where it belongs: In the waters.